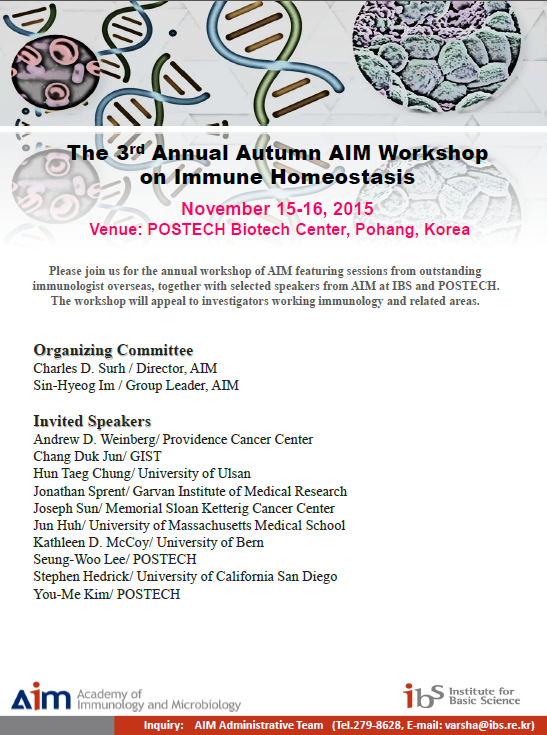 Academy of Immunology and Microbiology (AIM), Institute of Basic Science (IBS), would like to invite you to <The 3rd Annual Autumn AIM Workshop on Immune Homeostasis> on Nov. 15-16 (Sun-Mon), 2015. To register for the workshop, please visit http://indico.ibs.re.kr/e/aimworkshop2015 and register on-line (*No registration fee). Please note that online registration is available until Nov. 8, 2015 and luncheon on Nov. 15 will be offered so please join in this pleasant meal through the registration before the deadline. We look forward to welcoming you to the AIM Workshop 2015! – Date: 15-16th November, 2015.